Clear Tip Out Tilt Bin Space saving bin units keep small and medium sized parts organized, sorted and easy to find. These clear, break resistant injection molded plastic containers tip open smoothly to a 45° angle and are completely removable for easy access and refilling. Molded handle with slots for labels provided. Bins are easily cleaned with soap and water. 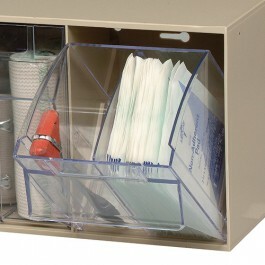 Polystyrene cabinet can be stacked or wall mounted. Exterior available in White, Ivory and Gray. Cups are clear. Divider allows cup to be converted into 2 compartments.